There is a lot of the blame game getting played this morning by Pens fans and hockey talking heads - and there is plenty of blame to go around. The Pens leave Pittsburgh - headed to Boston - in a 2 games to none hole. Even worse, the Pens just got demolished in game 2. Completely and totally dominated in every single facet of the game. There is very little to look at from game 2 and have anything even remotely nice to say about it. Volumes could be written about what went wrong for the Penguins in game 2, and while I enjoy a good goalie controversy debate as much as the next guy, the truth is that most of the blame game and recrimination is little more than sports talk masturbation: it might feel good at the time, but its not going to produce anything. Instead of focusing on who is to blame, how about we focus on who can turn the tide, and without question there is only one person for the Penguins who can single-handedly turn this series around. The one person isn't Dan Bylsma - though Bylsma making adjustments would help, the one person isn't in between the pipes - though getting consistent goalie play would help, the one person isn't Kris Letang - though having Letang make fewer mistakes would help, no it is none of those people. The one person on the Penguins who can single handedly take this team on his back and turn this series around is Sidney Crosby. 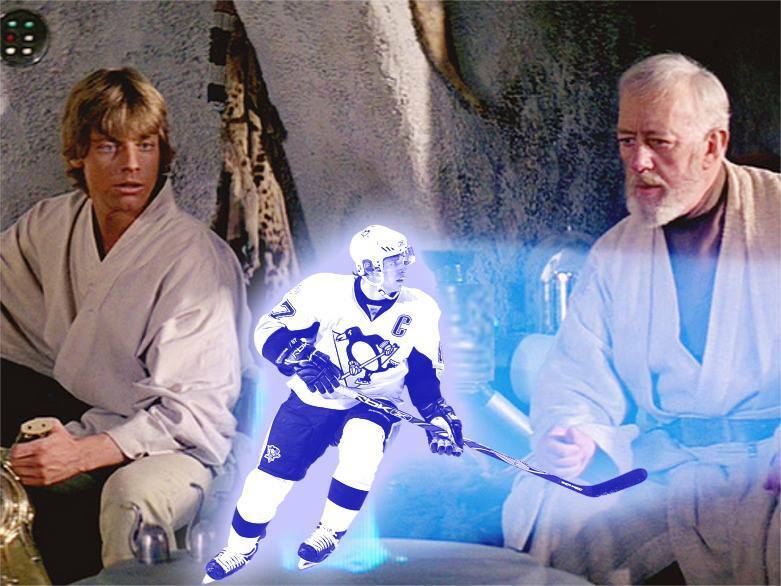 Sidney Crosby, you're our only hope. Sidney Crosby playing like - well playing like Sidney Crosby, the best player on the planet - can be an immediate series changer. No one has more ability to make the parts around him look better than Sid. Crosby has transformed Pascal Dupuis and Chris Kunitz from career marginal players to big time scoring threats. Nothing will take pressure off of our defense like Sidney Crosby scoring goals and facilitating the scoring of goals. In turn, nothing will make our goalies improve like a couple goal lead, a lead that Sid can single handedly deliver. All roads lead to Sidney Crosby for this team. He isn't just the guy wearing the C on his sweater, like say Alexander Ovechkin, no Sidney Crosby is the unchallenged leader of the Penguins locker room. When Sid loses his cool - like he did last year against the Flyers and in game 1 against the Bruins - the rest of the team loses its cool. But when Sid is in the zone and his emotions are in check - he keeps the rest of the team in check. I don't know if the Penguins can dig out of this 2-0 hole. But I do know one thing, if they are going to do it, if they will make another 91-esque turn around, it will be on the back of Sidney Crosby.